3rd stage of the server L2Remastered will begin on Monday, April 15 at 20:00(GMT+3). Territorial wars will take place this Saturday, then Sieges at Sunday, and on Monday a new cycle of the Olympiad and 3rd stage of the server are waiting for the server. I personally really wanted to prepare my knowledge base in which all the features and lists of drops and spoils would be described in detail (I’ll insert one point here - drop bases and spoils only for content available in low-levels so that the content added later by us - players could learn on my own, but nevertheless with a brief guide). Knowledge base for Lineage 2 Remastered is necessary because the product is unique and popular, which means that work on the L2R will definitely continue. For now, it is necessary to submit information through the good old method - the forum. Attention! All of the following skills have been added to Lineage 2 Remastered. Skills from 76 to 80 you can learn from any available knowledge base High Five Chronicles. At the moment, the system of character skills has been completely taken from the chronicles of the High Five..
Real Target (1 level can be learned at 76 level) - Decreases Bow Resistance by -12% and Crossbow Resistance by -10% for 30 seconds. Real Target (2 level can be learned at 77 level) - Decreases Bow Resistance by -16% and Crossbow Resistance by -15% for 30 seconds. Real Target (3 level can be learned at 78 level) - Decreases Bow Resistance by -20% and Crossbow Resistance by -20% for 30 seconds. Real Target (4 level can be learned at 79 level) - Понижает сопротивление к уроне от лука на -24% и понижает сопротивление к Stun на -25% на 30 секунд. Double Shot (38 level can be learned at 76 level) - Power 6389. Double Shot (39 level can be learned at 77 level) - Power 6446. Double Shot (40 level can be learned at 78 level) - Power 6503. Double Shot (41 level can be learned at 80 level) - Power 6615. Sigil Mastery Mage (can be learned at 76 level) - When a Sigil is equipped, increases spell casting speed +9%, increases M. Atk. by 4% and MP recovery bonus by 17%. Chain Heal (can be learned at 80 level) - Recovers the target and the 10 most injured allies around the target by 30% of their Max HP. The recovery amount decreases starting from the most injured person. Requires 4 Spirit Ore. Available to use Skill Transfer (Skill-Link). Counter Critical (can be learned at 79 level) - Attention! It is a complete analogue of Chant of Protection, it can not be used together with the analogue and does not give a bonus to physical. attack. Sigil Mastery Summoner (can be learned at 76 level) - Increases spell casting speed +9%, Maх. МР by 5% and recovers 17% MP when using Sigil. Sigil Mastery Support (can be learned at 76 level) - When a Sigil is equipped, increases spell casting speed +9%, healing effects by 30, and MP recovery by 17%. Dance of Berserker (can be learned at 80 level) - Decreases a party member's P. Def., M. Def. and Evasion, and increases their P. Atk., M. Atk., Atk. Spd., Casting Spd. and Speed for 2 minutes. Summon Nightshade - summon settings changed. Seal of Limit (can be learned at 80 level) - For 5 minutes, blocks CP/HP/MP recovery of nearby enemies by 70%. Great Fury (can be learned at 78 level) - Creates chance of activating Great Fury on a party member if Burning Chop is in use. Fighter's Will - When using melee weapons, increases P. Atk. at 100 and Atk.Spd. by 10% During the attack, the power of physical skills and the chance of a critical hit are increasing. Magician's Will - Increases M. Atk. 5% and Cast.Spd. by 5% chance to Magical Critical Hit +5%. Decreases MP Consumption by 5%. Archer's Will - When a bow or crossbow is used, Accuracy increases by 8 and the Attack Range increases by 50. During an attack, the power of physical skills and the chance of a critical hit are increasing. How to learn passive skills? In the Lineage 2 Remastered version, you can to upgrade weapons and armor using elemental stones. Improving the weapon you increase your damage with element attribute, and to protect against the elements you can use attribute stones in armor. Element stones cannot be inserted into jewelry. To create stones of elements it is necessary to obtain stones containing energy. Three stones of the same type are exchanged for elemental stone. The exchange of stones occurs at the NPC Yang in any town, you can find it near the Gatekeeper. Dark Energy Compression Stone - Pagan's Temple. The chance of inserting stones into weapons and equipment is not 100%, unsuccessful attempts to insert stones into objects are possible. If attempt failed stone is disappear. The full bodies of the S-grade sets were divided into two parts. Now in all sets of S-grade there are 5 things. Varka and Ketra`s quests for S equipment were changed. Draconic Leather Armor Set - +1 Dex, +1 Str, -2 Con, +4% P. Atk, +4% P.Aspd, +289 MP, +5759 weight limit. Major Arcana Robe Set - +1 Wit, +1 Int, -2 Men, +8% M.Atk, +7 Speed, -50% chance of interrupting a spell when hit by an opponent, +5759 weight limit. Symbols are items of equipment that magicians, shamans, summoners use to get additional bonuses. Reinforced Arcana Sigil - full protection of the shield, the speed of casting spells + 6% + bonus from passive skills of the characters. How to get Arcana Sigil? Arcana Sigil Upgrade to Reinforced Arcana Sigil is available in the game store. Sealed Imperial Crusader Shield Part 24 pieces. Leolin's Mold - 1 pieces. Mithrill Alloy - 36 pieces. Synthetic Cokes - 12 pieces. Crafted Leather - 12 pieces. Gemstone S - 2 pieces. Crystal S - 17 pieces. Now, while completing quests for 3rd class change for classes Cardinal, Eva's Saint, Shillien Saint is given the opportunity to receive additional skills from another class of healer. 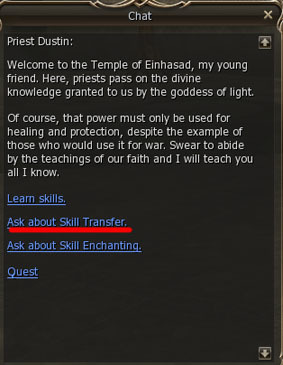 You can learn skills through NPC (Priest, High priest, Magister). For learning one skill, you need one of Holy Pomander (Sacred Incense). This item can be obtained by completing the quest for 3rd class change. By learning the skill you give away Holy Pomander and 10.000.000 Adena. It is possible to cancel the selected skill and get Holy Pomander back. Increased attack parameters for weapons of heroes. The manager of the Olympiad added the ability to insert stones of elements in the weapons of heroes. Vitality elixirs can now be used at any level. The level of the boss and monsters inside the ship was raised to 75. Warcryer (most popular buffer) gets the full effect of level 83 skill (from retail L2), but Prophet gets same skill as WC gets at level 78 (chant of protection) at 79 without the offensive output (100% critical damage on proc), this is the only reason for even making the prophet class. You will kill the class entirely with this change. Please add the critical damage proc back into the game. If it's for balance, add something else new in place of it. As it is right now the class will not exist at all. This will also destroy the dagger class end game as well as other melee classes. So what are the requirements for crafting armor? Where is database or changelog with exact description what has change and how? All moobs in pagan drop stones ?? Can we have any info about drop rate and moobs list ?? @Daeva looking for more info regarding Prophet buffs if possible! we are discussing on this matter in team, i will give you know if something will be changed. Thank you for looking into it, I look forward to playing my prophet I also think the dagger community will thank you too.